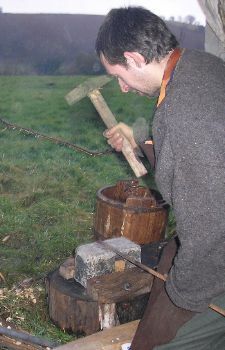 With a background in blacksmithing and Experimental Archaeology, I am now offering an Ancient Blacksmith for hire. All of my equipment is based on archaeologically recovered material where possible, or has been made by me using known technologies of the period being depicted; predominately my forge set-up is that of an itinerant smith living in the 6th century BC. 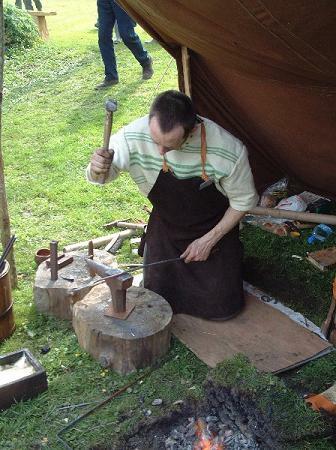 I can demonstrate the art of blacksmithing to enhance open day events for university archaeology departments, heritage centres, country shows, archaeological sites/excavations, etc. 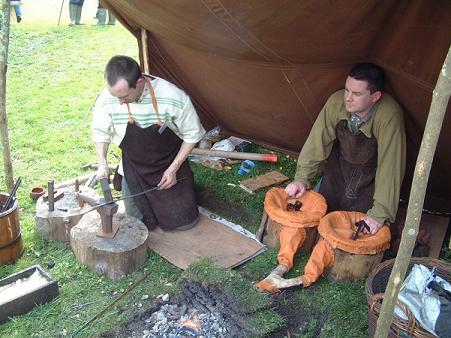 Or using my specialist knowledge of early ferrous metallurgy, iron working and tool making I can be hired as a visiting expert to teach further and higher education classes in the fun, practical setting of my Iron Age forge. 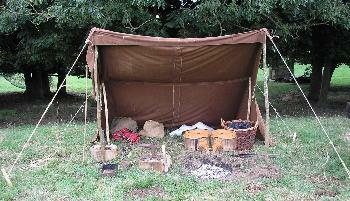 If you would like to see me in action, you will find a list of shows that the Iron Age Blacksmith will be attendiing here. N.B. 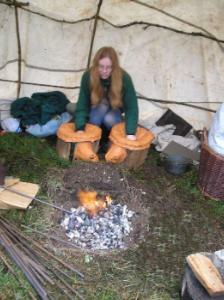 I have recently seen other schools and the like offering 'Iron Age blacksmithing', but beware! Many are using set ups that bare a passing resemblance to my own, but they may not be all they appear! All of my equipment at shows, demonstrations and courses advertised as being of the Iron Age is archaeologically correct. I have spent a great deal of time in researching and recreating the kit to be this way. They say that imitation is the greatest form of flattery, but remember if you want the real deal; then I'm the closest thing there has been to an Iron Age blacksmith for nearly 2000 years! For public demonstrations I have this basic intinerant smiths' set-up. This is essentially what any modern blacksmith would take to a country show, with the forge, air supply, anvil, hammers and tongs. The only difference is that my forge is a hole in the ground, my anvil is at knee height and my air supply is provided by ancient types of bellow. This set-up can by sited anywhere that a small depression in the ground can be made. Though I primarily work in the Iron Age, I can modify the tools used to cover any period from the very early Iron Age up to the early Medieval period. I have assembled a sufficiently large range of blacksmithing equipment to allow a small group to learn the basics of blacksmithing and to get to grips with the changes in technology through the ages. With my in-depth knowlege of ferrous metallurgy I am able to teach an aspect of materials science that is normally rather dry and difficult to grasp, but by combining it with practical demonstrations I can bring it to life. My extra equipment includes spare anvils, hammers and tongs, Iron Age pot bellows, ealier bag bellows and later kite bellows (Roman onwards). I also have stone anvils and hammers for those students wishing to try the tools of the earliest metal workers and a set of Kenyan tools for ethnographic comparison. 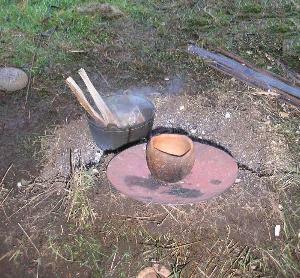 I also teach blacksmithing courses with the Iron Age forge setup. For more information of the types of course offered and for dates of those already planned, please take a look at my Courses page.